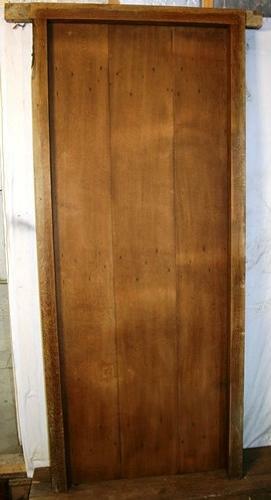 A Cottage Style Oak Door, stripped back to bare oak. With 3 wide panels backed with 3 ledges, includes hinges and frame. The frame measures: width (not including the horns) 865mm x height 2030mm x 71mm There is some damage at the top of one of the frame posts which we can repair. Please contact us to discuss options.